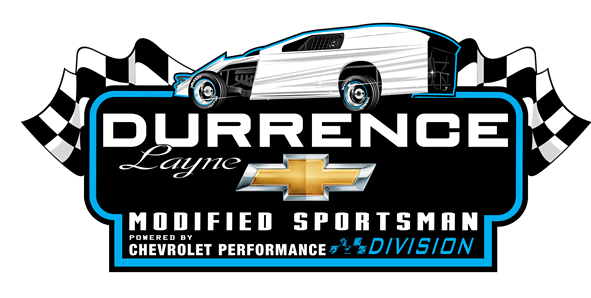 CARTERSVILLE, GA – Week 27 brought the 2018 Durrence Layne Weekly Racing Series season to a close and the top ten drivers in each of the four Divisions have been decided. The top ten drivers in each Division have earned a seat at the table for the Annual Durrence Layne Racing Awards Banquet in January at the Georgia Racing Hall of Fame in Dawsonville, GA. The complete Durrence Layne Weekly Racing Series Week 27 results for each track are listed below, and the complete final 2018 point standings for each of the four Divisions have been posted at www.durrencelayneracing.com. That takes you to the Launch Page where you can click on the Divisions you’re looking for. Evan Ellis of Plantersville, MS is your 2018 Durrence Layne Chevrolet Late Model National Champion with a best 14-week total of 699 points. Ellis had 14 wins, 17 top five finishes and 18 top ten finishes in 18 races. Ellis did not compete in Week 27 action. Double E will pick up a check at the banquet for $10,000. Steve Russell of Pontotoc, MS is second with a best 14-week total of 696 points after 13 wins, 33 top five finishes and 39 top ten finishes in 44 races. Sid Scarbrough of Florence, MS finishes in the third spot with a best 14-week total of 695 points. Scarbrough was the busiest driver, competing in 48 races with nine wins, 33 top five finishes and 46 top ten finishes. Scarbrough took his ninth win of the season on Saturday night at Jackson Motor Speedway in Jackson, MS to net one point. Cory Dumpert of York, NE finished fourth in the 2018 Late Model standings with a best 14-week total of 689 points. Dumpert did not compete in Week 27 action. Tootie Arnold of Meadeville, MS finished second on Saturday night at Jackson Motor Speedway to net on a 47 and move up to the fifth spot in the standings with a best 14-week total of 688 points. The 2017 Durrence Layne Weekly Racing Series Late Model National Champion Josh Leonard of Gibbon, NE finished sixth in this year’s standings with a best 14-week total of 687 points. Seth McCormack of Muscle Shoals, AL is seventh with a best 14-week total of 686 points. Neither Leonard nor McCormack competed in Week 27 action. Chase Walls of Decherd, TN and the 2012 Durrence Layne Weekly Racing Series Late Model National Champion Chase Washington of Houlka, MS tied for the eighth spot, each with a best 14-week total of 680 points. Walls wins the tie-breaker with four 50-point wins to two 50-point wins for Washington. Neither Walls nor Washington competed in Week 27 action. Shannon Lee of Lumberton, MS rounds out the top ten with a best 14-week total of 677 points. 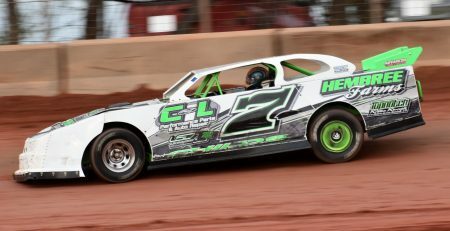 Lee finished fourth on Saturday night at Jackson Motor Speedway in Week 27 competition, but was unable to net on a 47. Ricky Idom of Hattiesburg, MS is the 2018 Durrence Layne Performance Parts Street Stock Division National Champion with a perfect best 14-week total of 700 points. Idom turned in 18 wins, 21 top five finishes and 22 top ten finishes in 24 races. Idom joins his son as a Durrence Layne Street Stock National Champion. Jeremy Idom won the title in 2014. David Williamson of Seminary, MS and Lee Ray of Columbus, MS tied for the Runner-Up spot, each with a best 14-week total of 692 points. Williamson wins the tie-breaker with eight 50-point wins to six 50-point wins for Ray. Williamson finished sixth on Saturday night at Jackson Motor Speedway and was unable to net on a 48. Ray did not race in Week 27 competition. 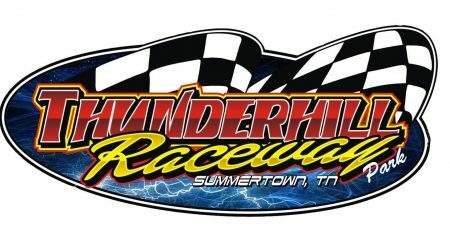 Mark Haddon of Winchester, TN finished second on Saturday night at Duck River Raceway Park in Lewisburg, TN to net on a 40 and bring his best 14-week total to 685 points. That enabled Haddon to finish fourth in the 2018 Street Stock standings. Chad Winkles of Hartselle, AL finishes in the fifth spot with a best 14-week total of 682 points. Winkles did not compete in Week 27 action. Steve Maughan of Florence, AL will finish sixth in the 2018 Street Stock National standings with a best 14-week total of 677 points. 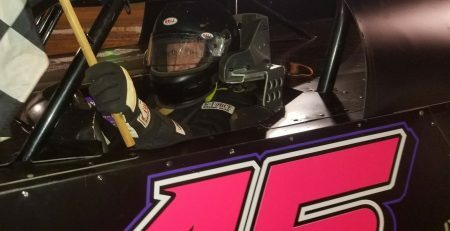 Maughan raced to a 39-point second-place finish on Sunday afternoon at North Alabama Speedway in Tuscumbia, AL and was unable to net on a 45. Frank Wilson of Milton, FL took the win on Saturday night at Southern Raceway in Milton, FL to net on a 41 and move into the Top 10 of the Street Stock standings. Wilson finishes in the seventh spot with a best 14-week total of 676 points. Colby Brandon of Trezevant, TN is eighth in the standings with a best 14-week total of 673 points. Brandon finished sixth on Saturday night at Duck River Raceway Park to net on a 42. Howie Reeves of Crestview, FL and Michael Blount of Sumrall, MS will tie for the ninth spot in the final 2018 Street Stock National standings, as each driver turned in a best 14-week total of 671 points. Reeves wins the tie-breaker four 50-point wins to three 50-point wins. Neither driver raced in Week 27 competition. Hayden Duncan of Leighton, AL is the 2018 Durrence Layne Chevrolet Late Model Sportsman Division National Champion with a best 14-week total of 697 points. Duncan had 15 wins, 24 top five finishes and 28 top ten finishes in 30 races. Duncan finished third on Saturday night at North Alabama Speedway and failed to net on a 48. Bryson Mitchell of Russellville, AL will finish second in the 2018 Late Model Sportsman standings with a best 14-week total of 694 points. Mitchell had a pair of wins on Saturday night and Sunday afternoon at North Alabama Speedway to net on a 49. Mitchell’s wins are pending a teardown inspection by Durrence Layne Racing Technical officials on his Chevrolet Performance 602 Circle Track Engine. Cole Brown of Cullman, AL is third with a best 14-week total of 689 points. Brown finished fifth on Saturday night at North Alabama Speedway to net on a 44. Blake Ray of Russellville, AL is fourth with a best 14-week total of 686 points. Ray was able to net on a 48 after a second-place finish at North Alabama Speedway on Saturday night. Tony Shelton of Steens, MS is fifth with a best 14-week total of 677 points, and Brandon Crosby of Anniston, AL is sixth with a best 14-week total of 674 points. Todd Clemmons of Killen, AL is seventh with a best 14-week total of 663 points, and Chace Pennington of Steens, MS is eighth with a best 14-week total of 654 points. Neither Shelton, Crosby, Clemmons, nor Pennington competed in Week 27 action. Steve Pate of Heflin, AL will finish ninth in the Late Model Sportsman Division National standings with a best 14-week total of 652 points. Pate finished fifth on Sunday night at Talladega Short Track in Eastaboga, AL to net on a 43. Tody Ratcliff of Meridian, MS will round out the top ten with a best 14-week total of 646 points. Ratcliff did not compete in Week 27 action. The honor and the answer to a future trivia question of being the first-ever Durrence Layne Chevrolet Modified Sportsman Division National Champion goes to Oakley Gillespie of Five Points, TN. Gillespie had six wins, 20 top five finishes and 21 top ten finishes in 21 races. 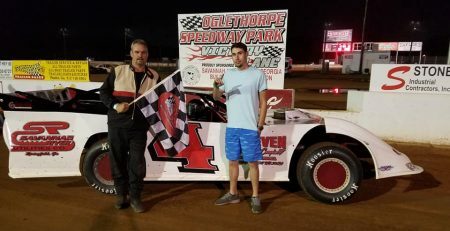 Gillespie drove to a 40-point win on Sunday afternoon at North Alabama Speedway to net on a 39. Andy Davis of Odenville, AL is the Modified Sportsman National Championship Runner Up with a best 14-week total of 623 points. Davis raced to a 47-point fourth-place finish Sunday night at Talladega Short Track to net on a 39. Casey Dunavan of Medina, TN is third in the standings with a best 14-week total of 614 points. Dunavan did not race in Week 27 competition. Tracy Terrell of Russellville, AL is fourth with a best 14-week total of 608 points. Terrell turned in a 38-point third-place finish on Sunday afternoon at North Alabama Speedway, and failed to net on a 38. Justin Angle of Anniston, AL is fifth with a best 14-week total of 607 points. Angle did not compete in Week 27 action. Chris Yarbrough of Eastaboga, AL is sixth in the Modified Sportsman final National standings with a best 14-week total of 582 points. Yarbrough took the win on Sunday night at Talladega Short Track to net on a 38. David Nichols of Hodges, AL is seventh with a total of 578 points. Nichols was still earning full points with a 36-point fifth-place finish on Sunday afternoon at North Alabama Speedway. Luke Riddle of Hartselle, AL is another driver that earned full points on Sunday afternoon at North Alabama Speedway. Riddle’s 39-point second-place finish brought his total to 547 points and eighth in the standings. Mike Wilkins of Clanton, AL finished ninth in the standings with a total of 537 points after earning 45 points with a sixth-place finish on Sunday night at Talladega Short Track. Brent Smith of Rutherford, TN rounds out the top ten in the final 2018 Modified Sportsman National standings with 496 points. Smith did not compete in Week 27 action. 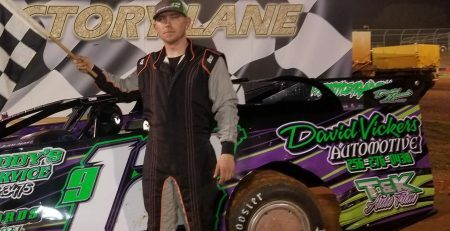 A total of 1,209 different drivers competed in the 2018 27-Week Durrence Layne Weekly Racing Series season. There were 482 Street Stock drivers, 435 Late Model drivers, 240 Late Model Sportsman drivers, and 52 Modified Sportsman drivers. DURRENCE LAYNE CHEVROLET LATE MODEL DIVISION: 1. Joshua Bishop; 2. Eddie Morris; 3. Shane Riner; 4. Lonnie Brant; 5. J. Jay Reich; 6. Caleb Gray; 7. Jim Manka; 8. Elliott Sanders; 9. Chip Beach DNS; 10. Donnie Bazemore Jr. DNS; 11. Eric Register DNS. DURRENCE LAYNE CHEVROLET LATE MODEL DIVISION: 1. Darin Patrick; 2. Ethan McMillan; 3. Buddy Wilkins. 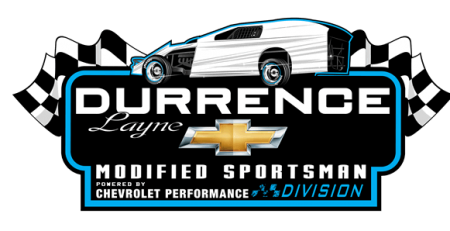 DURRENCE LAYNE CHEVROLET LATE MODEL DIVISION: 1. David Seibers; 2. Brad Skinner; 3. Farris Lovett; 4. Dalton Melton; 5. David Jackson. DURRENCE LAYNE PERFORMANCE PARTS STREET STOCK DIVISION: 1. Brian Hudson; 2. Mark Haddon; 3. Kevin Whaley; 4. Gaven Steagall; 5. Josh Bondurant; 6. Colby Brandon; 7. Dillard Hatchett; 8. Kody Waldrof; 9. Logan Hudson. DURRENCE LAYNE CHEVROLET LATE MODEL DIVISION: 1. Sid Scarbrough; 2. Tootie Arnold; 3. Ryan Colby; 4. Shannon Lee; 5. Chase Williams; 6. Hunter Watts; 7. Bill Dunaway; 8. Joshua Patterson. DURRENCE LAYNE PERFORMANCE PARTS STREET STOCK DIVISION: 1. Jeff Butler; 2. Matt Byram; 3. Cale Hollingsworth; 4. Michael Sojourner; 5. Dewayne Estes; 6. David Williamson; 7. Carl Stanley Kilgore; 8. Shelby Sheedy; 9. Tyler Moak; 10. Jennifer Cooper-Monk; 11. Ryan Allday; 12. James Head; 13. Corky McLendon. DURRENCE LAYNE CHEVROLET LATE MODEL SPORTSMAN DIVISION: 1. Chase Williams; 2. Nick Thrash; 3. Bill Dunaway; 4. Chris Rawson. DURRENCE LAYNE CHEVROLET LATE MODEL SPORTSMAN DIVISION: 1. Bryson Mitchell; 2. Blake Ray; 3. Hayden Duncan; 4. Tony Chaney; 5. Cole Brown; 6. Russ Brasel; 7. Jason Markewitz; 8. Morgan Lambert; 9. Jon Miller; 10. Chuckie Gipson; 11. Jeremy Greenway; 12. Cruz Wallace; 13. Michael Dickinson; 14. Jake Graves; 15. Silas Hamm; 16. Jarrett Miller; 17. Heather Lowe; 18. Ethan Putman; 19. Austin Holder; 20. Grayson Brewer; 21. Randy Brewer. DURRENCE LAYNE CHEVROLET LATE MODEL DIVISION: 1. DURRENCE LAYNE PERFORMANCE PARTS STREET STOCK DIVISION: 1. Frank Wilson; 2. J.C. Wilson; 3. Austin Moye; 4. Kyle Kichler; 5. Tommy Lowery; 6. David Peleschak; 7. Joseph Nicholson; 8. Chris Bayhi. DURRENCE LAYNE PERFORMANCE PARTS STREET STOCK DIVISION: 1. Bryan Fortner; 2. Steve Maughan; 3. Ethan Sims; 4. Jimmy Nolen; 5. Darren Jewell; 6. Noel Bailey; 7. Clint Johnson. DURRENCE LAYNE CHEVROLET LATE MODEL SPORTSMAN DIVISION: 1. Bryson Mitchell; 2. Blake Ray; 3. Russ Brasel; 4. Ethan Putman; 5. Jason Markewitz; 6. Tony Chaney; 7. Michael Dickinson; 8. Haden Duncan; 9. Heather Lowe; 10. Joel Russell; 11. Jake Graves; 12. Cruz Wallace; 13. Jon Miller; 14. Jeremy Greenway; 15. Morgan Lambert. DURRENCE LAYNE CHEVROLET MODIFIED SPORTSMAN DIVISION: 1. Oakley Gillespie; 2. Luke Riddle; 3. Tracy Terrell; 4. Casey Ledlow; 5. David Nichols; 6. Chuckie Gipson; 7. Wayne Vintson. DURRENCE LAYNE CHEVROLET LATE MODEL DIVISION: 1. Cruz Skinner; 2. Sam Seawright; 3. Jason Lively; 4. Red Farmer; 5. Austin Freeman; 6. David Kay; 7. Lee Burdette; 8. Mike Combs; 9. Logan Palmer; 10. Brandon Brown; 11. Heath Carr; 12. David Culver; 13. Landon McElroy; 14. Alan Banks; 15. Clifford Holder; 16. Michael Isbell. DURRENCE LAYNE PERFORMANCE PARTS STREET STOCK DIVISION: 1. J.R. Brown; 2. Greg Wilkins; 3. Jose Chacon. DURRENCE LAYNE CHEVROLET LATE MODEL SPORTSMAN DIVISION: 1. 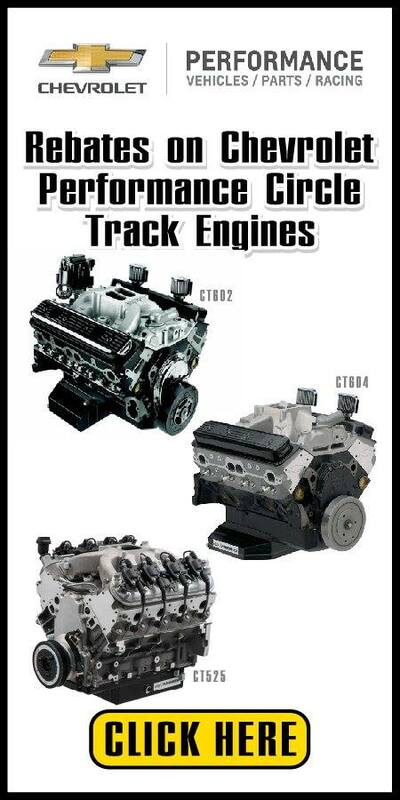 Ryan King; 2. Justin Angle; 3. Kevin Walls; 4. Jarad Gray; 5. Steve Pate; 6. Jim Wakefield; 7. Cole Brown; 8. Andy Meharg; 9. Michael Blakeney; 10. Lane Shuler; 11. Jeff Holt; 12. Jason Reed. DURRENCE LAYNE CHEVROLET MODIFIED SPORTSMAN DIVISION: 1. Chris Yarbrough; 2. Eddie Brannon; 3. Carlton Freeman; 4. Andy Davis; 5. Steven Forsythe; 6. Mike Wilkins; 7. Dale Stephens; 8. Joseph Champion; 9. Sonja Newton.